The term Wheel alignment describes the process of ensuring that the geometry of a vehicles steering and suspension components are correctly setup so that the vehicle travels straight and true. The correct positioning of your vehicles Wheel alignment is an important factor with regards to the longevity of life of steering and suspension components and indeed your tyres. What causes your cars wheels to become misaligned? 3. Ignoring speed bumps (we all do it). Hard knocks can and will eventually cause your vehicle to require wheel alignment services as this will gradually alter the precisely calculated locations that the components have been set in at the factory or during your last wheel alignment. All of the components that are designed to ensure that your vehicles wheels follow each other in a straight line are called "alignment. When you listen to a professional mechanic describe the wheel alignment process it can begin to sound a bit like splitting the atom but in reality it really falls down to three main measuring factors. The correct wheel alignment settings for any particular make and model of vehicle are clearly outlined by specific vehicle manufacturers, so the job of the auto technician (mechanic) is to set up the vehicle as close as possible to the manufacturer's guidelines. Modern vehicles are now much simpler to perform wheel alignment on as they commonly feature the MacPherson Strut which has effectively done away with the need to measure caster and camber. As there are no guarantees that the vehicle being aligned will feature a MacPhersoncpherson strut we will continue to explain caster and camber below. What is Caster (negative and positive)? The term caster is slightly more complex than camber and toe it is used to describe the angle of a vehicles ball joints when viewed from the side of the vehicle. 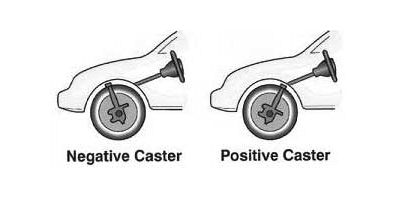 Positive Caster = Backward tilt. Negative Caster = forward tilt. Left and right caster should be equal in order for a vehicle to be able to travel/track in a straight line. Altering the caster will have a direct affect on the vehicles directional control. Caster is also directly affected by vehicle ride height, prior to adjusting caster one should ensure that the ride height is in line with the vehicle manufacturers guidelines. Overloading a vehicle can have an affect on caster as this will alter the ride height if the rear of the vehicle is lower than the manufacturers recommendations, the front suspension components will move to feature an increased positive caster. If the vehicles ride height has been altered to be higher than the manufacturers guidelines, the front suspension components will move to feature a reduction in positive caster. If the vehicle does not have enough positive caster the the vehicle steering can become twitchy at speed and the steering wheel may not return to the straight ahead position when coming out of a turn. When a vehicle has unequal caster it will manifest itself by the vehicle drifting to one side or the other, whichever direction the vehicle leads to will typically have the least amount of positive caster. Adjusting caster settings will require a set of bearing mounted turn plates to be able to correctly measure steering angle. If the vehicles wheels tilt outward at the top this is called (Positive Camber). If the vehicles wheels tilt inward at the top this is called (Negative Camber). The amount of tilt is measured in degrees from the vertical using a wheel alignment machine. Altering the camber settings allows the motor vehicle technician to influence the directional control of the wheel and the tyre. 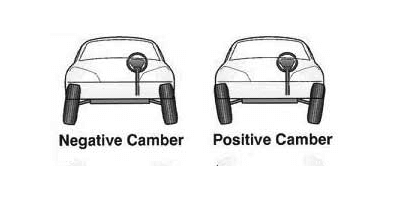 How does Negative & Positive Camber Affect Wheel Alignment? 1. When a vehicle has too much positive camber the tyres will typically show uneven wear on the outside edge (nearest the road) resulting in the tyres needing to be replaced prematurely, excessive positive camber will also result in suspension components degrading excessively and requiring replacement before their expected lifespan has passed. 2. When a vehicle has too much negative camber the tyres will typically show uneven wear on the inside edge (nearest the engine) excessive negative camber can also result in suspension components degrading excessively and requiring replacement before their expected lifespan has passed. When side-to-side camber is out as line by as little as 1° or more then this will cause the vehicle to pull to the side a simple indicator of this is to accelerate slowly and release your hands from the steering wheel if the vehicle begins to steer to the left or right unaided then the vehicle requires wheel alignment. Fig. 3: Toe in Toe Out explained. Toe is a measurement of how much the front and/or rear wheels are turned in or out from a straight-ahead position. When the wheels are turned in, toe is positive (+). When the wheels are turned out, toe is negative (-). The actual amount of toe is normally only a fraction of a degree. The purpose of toe is to ensure that the wheels roll parallel. Toe also serves to offset the small deflections of the wheel support system that occur when the vehicle is rolling forward. In other words, with the vehicle standing still and the wheels set with toe-in, the wheels tend to roll parallel on the road when the vehicle is moving. Improper toe adjustment will cause premature tyre wear and cause steering instability. Thrust angle is an imaginary line that should run parallel to the vehicle's geometric centre line (See Image), dependent on the suspension/axle setup present there are two ways to correct a vehicles thrust angle. 1. Solid Axle Setup, check the vehicle for axle offset. 2. Independent Suspension Setup, this particular setup can be adjusted and will require rear toe alterations to remedy the issue. Positive and negative thrust angle can be determined by the angle between the thrust line and centerline. 1. Positive Thrust Angle, when the thrust line is to the right of the vehicles centerline. 2. Negative Thrust Angle, when the thrust line is to the left of the vehicles centerline. What Causes the Thrust Angle to Become Misaligned? 1. The vehicle has been involved in a collision. 2. Axle position has been altered. 3. Axle has been bent. 4. Bent trailing arm or lateral link. 5. Degraded trailing arm bushes. 6. Incorrect/unequal rear toe adjustment. Misaligned thrust angle causes the vehicle to steer off center because the rear wheels are not correctly aligned with the front wheels. It can also contribute to poor directional stability on ice, snow or wet roads. If the thrust angle misalignment is caused by incorrect toe settings on the rear wheels it can be identified by an uneven diagonal wear on the vehicles rear tires, a simple way to see if thrust angle is incorrect is the steering wheel will appear to be off center when wheels are facing forwards. In order to correctly measure a vehicles thrust angle one must carry out a four wheel alignment process, a non-adjustable rear axle will still require you to take these readings in order to correctly align the vehicles front suspension. Correction of the vehicles rear axle or toe alignment will be required to effectively eliminate a misaligned thrust angle. 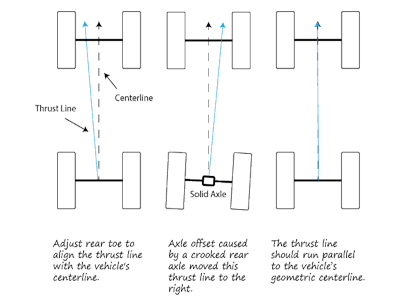 If that is not possible, using the thrust angle as a reference line for aligning front toe can restore center steering. Included angle is described as the sum of both the camber and SAI angles in a vehicles front suspension. This angle is measured indirectly and is performed by auto technicians to effectively diagnose bent/damaged suspension parts such as spindles and struts. What is Steering Axis Inclination (SAI)? SAI is the angle formed by a line that runs through the upper and lower steering pivots with respect to vertical. 1. On a SLA suspension (short long suspension) AKA unequal length double wishbone suspension the line runs through the upper and lower ball joints. 2. On a MacPherson strut suspension, the line runs through the lower ball joint and upper strut mount or bearing plate. Viewed from the front, SAI is also the inward tilt of the steering axis. Like caster, it provides directional stability. But it also reduces steering effort by reducing the scrub radius. A vehicles steering axis inclination SAI is a built-in at the factory non-adjustable angle and is used with camber and the included angle to diagnose bent spindles, struts and mislocated cross members. What is Set Back Negative and Positive? The term Set back is used to describe the scenario where one of the vehicles front wheels set further back from the other (see image). It is angle created by a right angle in relation to the vehicles axle centerline. 1. When the left wheel is set further back from the front of the vehicle than the right, this is known as negative setback. 2. When the right wheel is set further back from the front of the vehicle than the left, this is known as positive setback. Setback should usually setup to within half a degree of zero, some vehicles feature asymmetrical suspensions. Setback can be correctly measured when both of the vehicles are in the straight ahead position and is used as a helpful in correctly diagnosing along with caster whether the vehicles chassis may be bent/misaligned as a result of a collision. Setback does typically require adjusting but can if necessary be corrected to conform to the manufacturers original specifications. Ride height is identified as the distance between a manufacturer specified point from a motor vehicles chassis, suspension components or body shell and the road surface. checking the vehicles actual ride height against the vehicle manufacturers guidelines is the correct working method of assessing the height of a vehicles springs this is important the vehicles ride height has a direct affect on camber, caster and toe settings. A vehicles Ride height needs to conform to the manufacturers specifications prior to wheel alignment being carried out. When side-to-side camber is out as line by as little as 1° or more then this will cause the vehicle to pull to the side a simple indicator of this is to accelerate slowly and release your hands from the steering wheel if the vehicle begins to steer to the left or right unaided then the vehicle require wheel alignment. The purpose of toe is to ensure that the wheels roll parallel. Toe also serves to offset the small deflections of the wheel support system that occur when the vehicle is rolling forward. In other words, with the vehicle standing still and the wheels set with toe-in, the wheels tend to roll parallel on the road when the vehicle is moving. 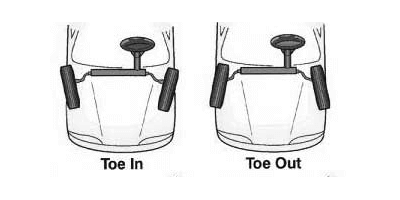 Improper toe adjustment will cause premature tire wear and cause steering instability. SAI is the angle formed by a line that runs through the upper and lower steering pivots when viewed from a vertical position. 1. On a SLA suspension (short long suspension) AKA unequal length double wishbone suspension the line continues through a vehicles upper and lower ball joints. 2. On a MacPherson strut suspension (shock absorber), the line runs through the lower ball joint and the vehicles upper suspension mounting plate located on the top of the front wheel arches. When looked at from the front of the vehicle steering axis inclination is the inward tilt of the steering axis. 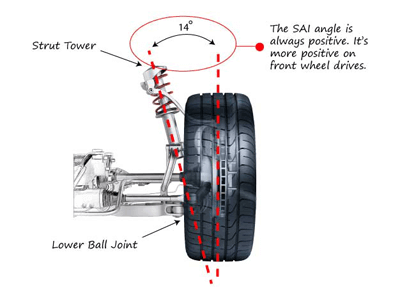 similar to caster correct adjustment provides increased directional stability as well as reducing the amount of effort required to steer the vehicle by further reducing the amount of contact the vehicles tyres have with the road under steering this is known as scrub radius. A vehicles steering axis inclination is set during its manufacture it is a non-adjustable angle that is used along with camber and included angle to help to effectively diagnose damaged components such as spindles, shock absorbers or incorrectly located cross-members.